Do you have a room in your home that you tend to ignore? You know the one…I’m sure it immediately came to mind. It’s the room you avoid at all cost, for one reason or another. That room, for me, is my daughters’ bathroom. It is always a mess AND it’s dark because there is no natural light. Unfortunately, it doubles as a guest bathroom when we have people staying with us, so it can’t be avoided completely. I would love to give it a full makeover. Here is the reality… I didn’t even attempt to clean it for you. My daughters are responsible for keeping it clean but aren’t the tidiest. 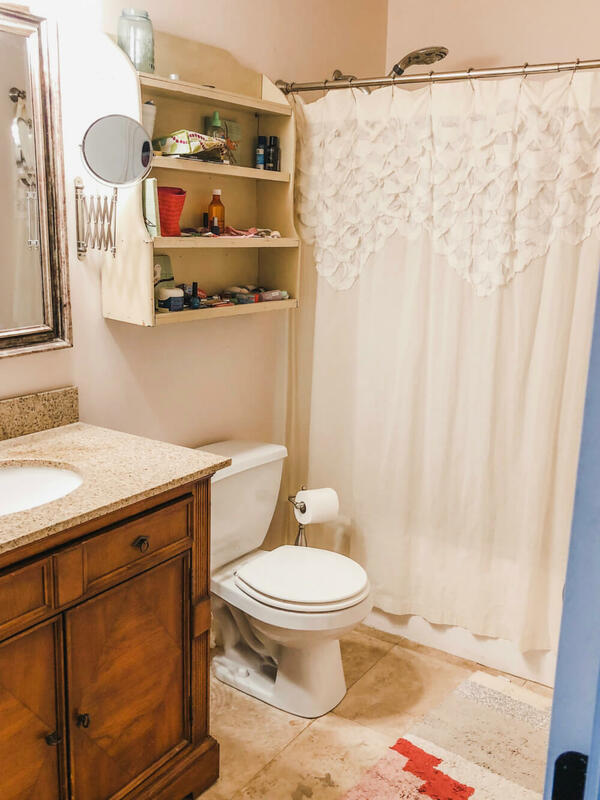 I am READY to get rid of that shelf above the toilet and replace it with something more like the storage in the inspiration photo. The part of the bathroom you can’t see in the photo is the area behind the door. That’s where I would have a built-in place for all their “stuff”! When we moved into our house 10 years ago, I changed out the linoleum floor with a travertine tile and replaced the vanity. 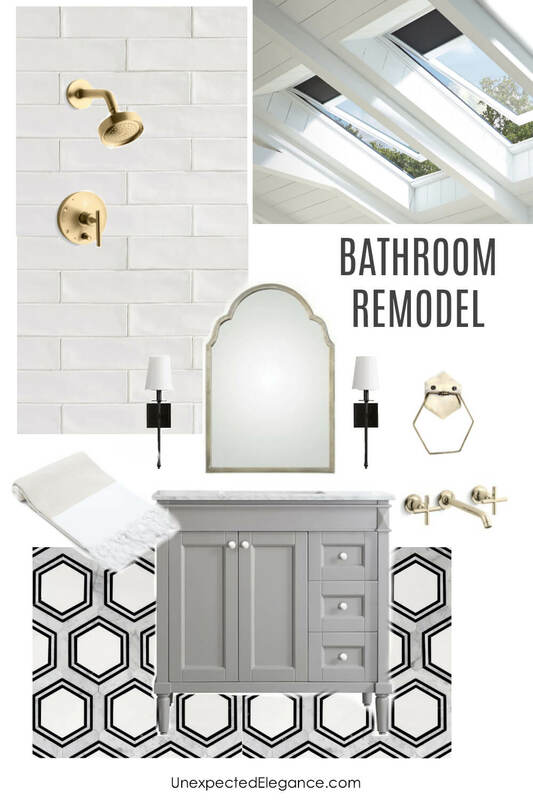 The bathroom is looking pretty dingy and it’s time to bring new life into the space. 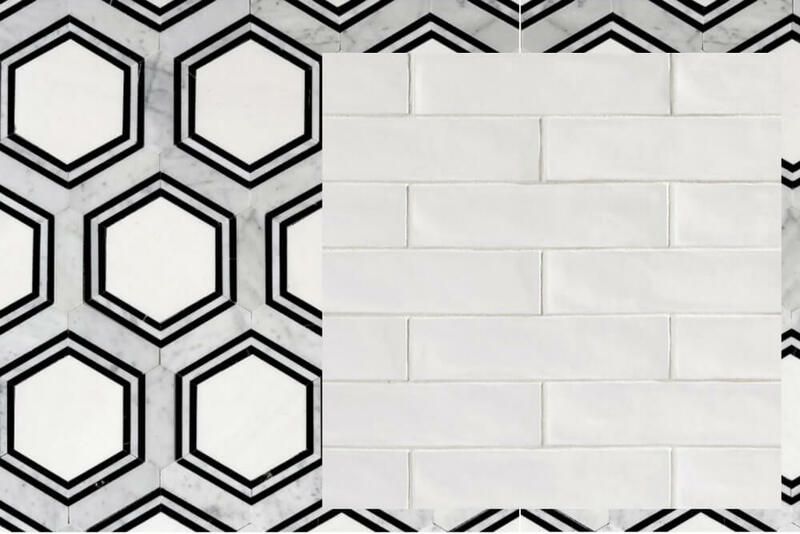 Marble tile is one of my favorites and this fun pattern is absolutely gorgeous. (I found it last year and have been dying to use it somewhere.) 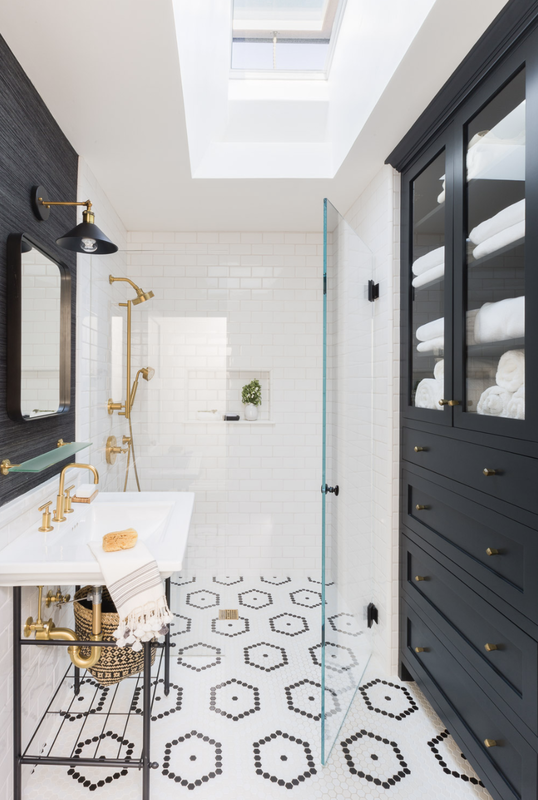 I’m also a huge fan of subway tile because it’s so classic, but I love this handmade version even better. 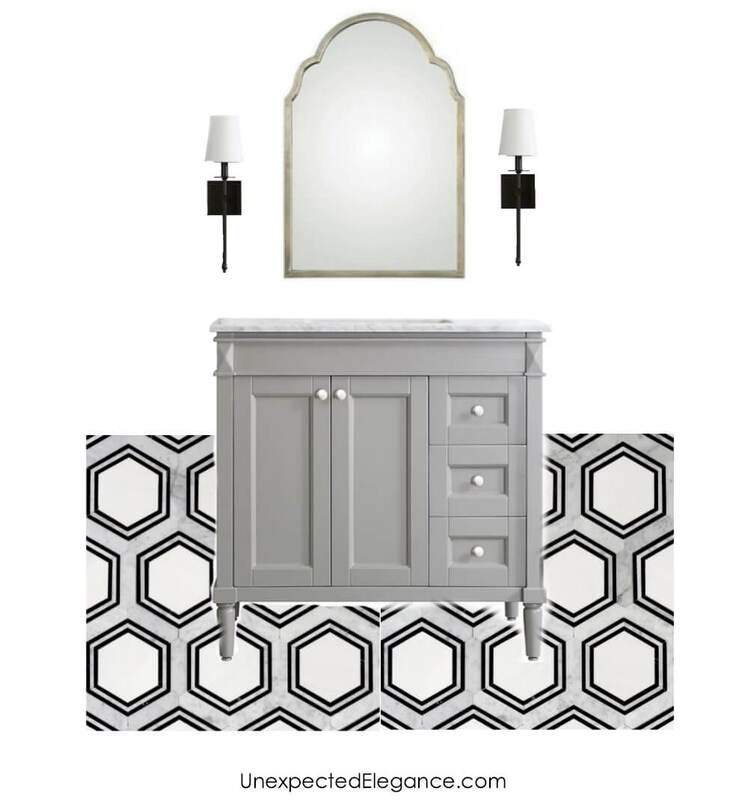 A new vanity to pick up on the gray in the marble would be perfect, but I’d be OK with just a fresh coat of paint on our existing cabinet! Also, a fun shaped mirror is easy to change out and inexpensive. However, if I could only make one change to the room it would be to add a skylight. This is an interior bathroom on the second floor so a skylight would the PERFECT solution. My friend, Sara, had VELUX skylights installed about a year ago and it completely transformed her dark loft. Her experience is what got me thinking about my bathroom. 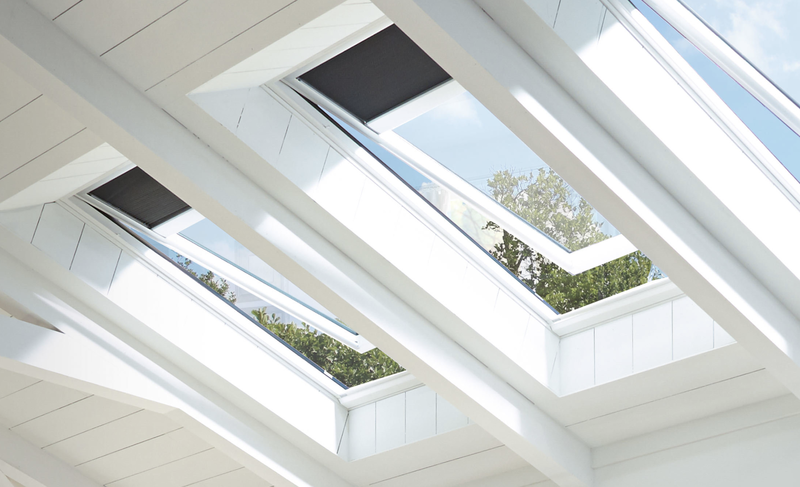 VELUX No Leak Solar Powered Fresh Air Skylights provide natural light from above, fresh air, and a sky view. The natural light coming from above provides balanced light throughout a room and helps colors appear true…which is great for teen daughters who are applying their makeup! Skylights open to release warm air that rises to the ceiling. Sky views are calming because they connect you to nature. How great would it be to feel like you’re showering outside? They have blinds built-in that will give me control over the light. I can block when needed. BEST PART: The blinds and skylight are controlled by a remote! Go check out whyskylights.com to learn more about skylights and Find a skylight installer in your area! VELUX is hosting a sweepstake right now a so be sure to go HERE and find out all the details to enter! NO PURCHASE NECESSARY. Void where prohibited. Ends on 3/6/19. Open to legal residents of U.S./D/C,18+ and who own their own home. Official Rules http://bit.ly/2E7arx1 . Sponsor VELUX America, Inc.
Do you have a room in your home that could use some extra light?? I’d love to hear about it!